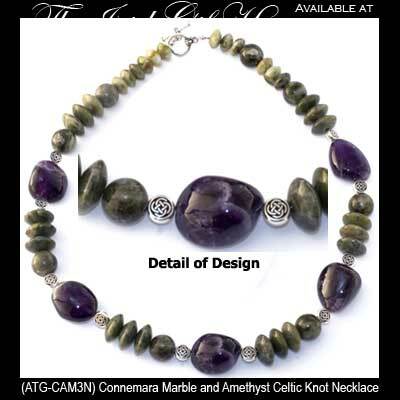 Connemara marble necklace is enhanced with a large amethyst stones along with beads that feature Celtic knot-work. This Celtic necklace features large 14mm Connemara marble beads along with a amethyst nuggets and it is enhanced with Celtic accent beads that are silver plated pewter with oxidized accenting. The Connemara marble necklace measures 18" long including the toggle clasp and the large amethyst bead measures 3/4". The Irish necklace is made in Kilkenny, Ireland by All That Glisters and it is gift boxed with Celtic knot and Connemara marble history cards, complements of The Irish Gift House. Connemara marble earrings are enhanced with amethyst stones along with silver plated over pewter beads that feature Celtic knots. Connemara marble bracelet is enhanced with a large amethyst stone along with silver plated over pewter beads that feature Celtic knots-work.